Often times travelers plan for vacations with things they want to do instead of a destination. 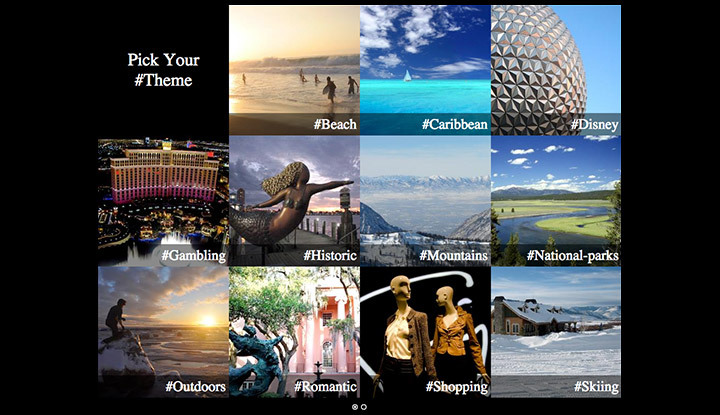 Sabre Dev Studio allows destination search based on themes, such as beach, gambling, historic, skiing, etc. By using these APIs, users can determine the best time to travel. This demo allows you to select a theme and determine an appropriate destination(s) for that theme. Themes include Travel Theme Lookup, Theme Airport Lookup, Lead Price Calendar, InstaFlight Search. From there you can choose your travel date, or click on “My Dates Are Flexible” to see the calendar of lead fares. Please note a limitation of this prototype version; it only supports trip durations between 1 – 14 days long. For example, a departure date of October 1 returning October 14 is valid, but a return date of October 21 would not work with an October 1 departure.